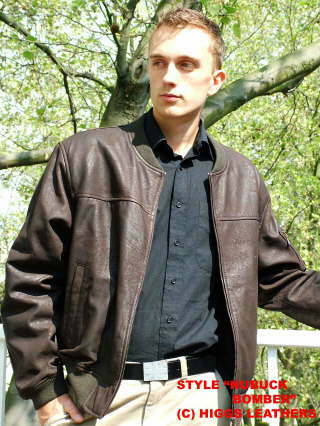 Super quality mens brown leather bomber jackets, at a very reasonable price! Made from extra soft Antique Brown shade Nubuck skins, with toning rib knitted small collar, cuffs and waistband, making this an exceptionally comfortable jacket. Fastens with strong antique metal zip. Two lower outer pockets plus zip pocket on the left arm with extra spaces for two pens. Two nubuck edged inner pockets (one with a zip) plus one small and one large mobile phone pockets! One of our favourite styles. Jacket length apprx. 26" (65.5cm).